King Corn is kind of like Super Size Me's little brother. It traces the pervasive influence of corn on modern America, including the obesity epidemic and the fact that Iowa is growing trillions of bushels of *non-edible* corn to continue receiving lucrative government subsidies. College buddies Ian and Curt, both from the east coast, discover that they both had distant relatives from the same small town of Greene, Iowa. Ian and Curt decide to go to Iowa and plant one acre of corn, following it through its lifecycle, including where it goes after the harvest. The film starts off slowly as the reasons for the trip are explained. The prerequisite talking heads introduce some scary factoids about how Americans are literally made of corn; if you do a hair analysis, it's like a diet diary, and the vast majority of the American diet (corn-fed beef, fast foods and processed foods) contains corn derivatives. Much of the corn we ingest is in the guise of high fructose corn syrup (HFCS), a cheaper alternative to sugar that is produced via a scary chemical conversion involving several toxic acids. HFCS has been directly linked to the current obesity crisis and its impact on Type II Diabetes (the body processes HFCS differently from table sugar). Prior to the 1970s, hardly any company used HFCS due to its high cost. But after then-Secretary of Agriculture Earl Butz did away with the old New Deal market control policies in favor of rapid expansion in 1973, there was a constant surplus of cheap (and non-edible) corn, fueling the rapid expansion of the corn syrup industry. Here's a quick test: walk into any convenience store and count how many items contain corn, specifically corn syrup. The list includes obvious choices like soda and candy, but you'll also find HFCS in deli meats, breads, ketchup, pickle relish, spaghetti sauce, and cough syrup. Oh yes, and one main variety of corn grown in Iowa (Liberty) is genetically modified, as is at least one ingredient in HFCS manufacturing. Corn production geared towards ethanol is briefly mentioned, but the majority of the focus in King Corn is on the impact of non-edible corn on the nation's food supply. In this respect, it's kind of a gentler version of Supersize Me; there's no shock value for the most part. Also mentioned is the disastrous consequence of converting cattle from grazing animals to force-fed confined ones. Cattle normally forage for a plant-based diet, but it is far more profitable to bring them up to market weight by forcing them to stand still and eat continuously. In addition, the acids present in corn cause deadly ulcers for the cows, who are slaughtered before developing acidosis. The end result is that 70% of the antibiotics in the US are used on livestock (antibiotics combat both the acidosis and the infections resulting from confinement). Literally everything at McDonald's contains corn: your hamburger is corn-fed, the bun contains HFCS, your soda contains HFCS, the French fries are fried in corn (or soybean) oil, and your ketchup and pickle contains HFCS. Ditto for most vending machine foods, frozen dinners, and anything you don't make from scratch. It's extremely difficult to escape buying foods containing corn, since a variety of pseudonyms are used, including baking powder, caramel color, dextrose, hydrolyzed vegetable protein, stearic acid, and vanilla, making it a nightmare for anyone with corn allergies. Perhaps the most effective element is that of nostalgia. Ian and Curt also take time to find their long-lost relatives in Greene, and to reflect on the rapid changes in our recently agrarian society that have forced farmers to maintain massive farms harvesting non-edible corn. In other words, the farmer can't even feed himself with what he's growing. Without the hefty government subsidies, such large-scale corn operations would be out of business. They interview various farmers and ranchers who are disgusted with the system, but who have little real choice (one farmer says flatly, "We're growing crap!"). We're shown the evolution of farming equipment and of the family farm itself as a quaint reminder of the past; there are nostalgic shots of Main Street and hometown parades, quiet diners and local bars. Follow two college students as they learn why corn showed up in their hair analysis. It also addresses the plight of the family farmer, what the farmer goes through to plant and harvest his corn crop, where corn is used in the entire food chain, the use of corn as fuel today, and hopefully, the use of corn silk, stalks, and cobs as future fuel source. is that CORN FARMERS, or farmers who grow ANYTHING, grow what makes money. Crops are subsidized so the gov't can keep control. Control how much is grown (acres), control the prices, and make sure they are "nicey nicey" to other countries and buy commodities from them. I want to laugh and say, if you could get a promotion and make more money, would you do it? Why should a farmer not do what makes them money? DUH! If commodities could be sold in a free market economy, it would be great. We don't want subsidies, we want a free market and the government's hand out of our business. Many farmers in the western high plains are barely making it. They're not rolling in money, they don't have retirement plans, they don't have many of the luxuries you city dwellers (and not self-employed workers) have....you work for someone who pays for your health insurance and offers a 401k? Must be nice! You worry about how much gas cost in your little car? Must be nice.....we spend THOUSANDS in fuel each month. I am not saying that they don't have some valid points, especially regarding the over processed food we eat. But its pretty ignorant to "blame corn" over it. 99.9% of my crop feeds cattle. Cattle ranchers would like to make money too, and feeding corn is more profitable in the long run than grass...besides, I hate to break the news to you, there is not an abundance of grassland in the country. You want exclusively grass fed cattle? Be prepared to pay....a lot! 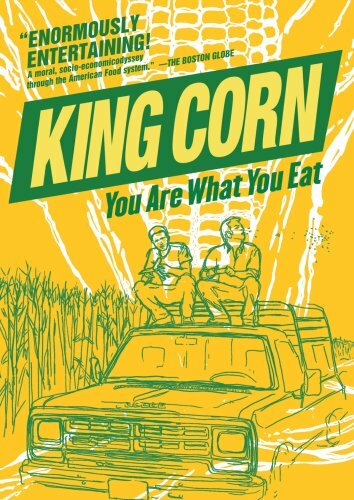 This film is an amazing look into the amazing complexity of corn production and consumption. It is encouraging me to seek grass fed beef and other more natural products (without high-fructose corn syrup). I was disappointed, however, that the writers failed to mention that corn production relies heavily on lots of equipment that use non-renewable fossil fuels. As fossil fuels get more scarce, prices will (hopefully gradually) rise. What will we do then? Offer more subsidies to farmers? Although not perfect, I'll give any documentary, movie, TV show or book five stars if it alters my life and King Corn definitely rates five full stars. I would highly recommend that everyone purchase or at least view this movie once; I had the opportunity to see it this week on PBS's series "Independent Lens." Corn is nothing but a "raw material" that is separated to almost its basic elements and used to build our daily "garbage" diet. I learned about the relationship between obesity and the use of high fructose corn syrup (aka HFCS) by accident a few years ago when I made a visit to Victoria, Texas and they sold Dr. Pepper with "Imperial Sugar" and the 10-2-4 logo on the bottle. I didn't know that sometime in the early 70's that the soft drink companies switched from sugar to HFCS as the sweetener. Who would have thought that decades after being told that sugar is bad for your teeth, etc., etc. that it is actually much better for you than the HFCS alternative! After watching this documentary I did some research and HFCS is in almost everything you buy. For example, it is that main ingredient in many of the ice cream syrups on the supermarket shelves... HFCS is in everything form hamburger and hot dog buns to "low fat" salad dressing! Honey graham crackers... EVERYTHING! Fast foods are full of this HFCS junk and this is only one of the many things you'll learn from this documentary. Where I live in Corpus Christi most of the population is obese, they exercise little (if at all), have a high incidence of diabetes and fast foods are their favorite filler. In fact, at the local Driscoll Children's Hospital on one side you have the emergency entrance and on the other the "golden arches." No joke! It is really sad. One can only project into the future after the wheat gluten from China killed our pets in the United States... Will we outsource growing corn to China so we can get even cheaper HFCS to fatten and kill our population off? My only minor criticism is that the filmmakers didn't explore our government's role in ruining our diets by providing a version of "corporate welfare" to factory farms that produce this junk. As it turns out, they would not be in this business, save the subsidies they get from the USDA. Go figure! UPDATE 13May08: A recent story in the The Wall Street Journal [1-year subscription] (May 7, 2008, Page B3A) by Susan Buchanan raises some interesting points on the use of corn syrup. I do not want to give anyone the impression that the only reason that our nation is obese is due to HFCS. In fact, the problem with obesity in the United States is the result of many interrelated and complex factors. They include, cheaper foods coupled with larger portions, an increase in eating out (especially at fast food joints), reduction in exercise and, unfortunately, a greater acceptance of being overweight as the "norm" in our society. As this film points out, our government is responsible for subsidies to make something that is unprofitable profitable, while at the same time making food cheaper with heavy doses of HFCS inside. I wish, instead, that our government would give big subsidies to organic farmers and tax breaks to those who walk or ride their bikes to work. Instead, our government (FCC) is more concerned with giving us more channels of digital TV by February 2009; another major cause of obesity is the time spent sitting in front of the tube. Where I live the Corpus Christi Police Department and Nueces County Sheriff's Department have almost a zero record in regards to protecting pedestrians, joggers and bicyclists. It is downright dangerous to make an effort to be physically fit where I live. At the same time, the situation in Corpus Christi is not, by any means, unique in our country. To reduce the epidemic of obesity in the United States we need a multi-pronged attack on the problem that includes support from our government for more healthful ways of life and a population that will say NO to eating junk and YES to exercise. Growing awareness of food vs. agribusiness. This interesting film illustrates what happens when food becomes more of a vehicle for making money than for feeding people. Most of the corn we grow in our 'breadbasket' is inedible for humans, and is used as feedgrain for cows (I wonder how much the cows like it as well). In addition to documenting their farming experiment, the filmmakers visited a massive cattle feedlot in Colorado. It brought to mind another movie that explores our meat industry Fast Food Nation. As the meat industry, like the cigarette industry, increases their global marketing, ever increasing amounts of grain are being used to feed cattle; along with creating fuels. Amazingly, some crops are being genetically modified to produce pharmaceuticals Transgenic Plants: A Production System for Industrial and Pharmaceutical Proteins. With growing food crises around the world, one wonders when we'll reach a tipping point and decide to create a food system that serves people instead of serving the interests of executives at Cargill and Archer Daniels Midland Rats in the Grain: The Dirty Tricks and Trials of Archer Daniels Midland, the Supermarket to the World. Thinkers like Frances Moore Lappe have long argued that the real issue behind a lack of food security is not a lack of food, but rather a lack of democracy World Hunger: Twelve Myths. We need to dethrone 'Kings' of corn and many other commodities and put decision making power into the hands of civil society, as Vandana Shiva has advocated for so eloquently Earth Democracy: Justice, Sustainability, and Peace. See some of Shiva's presentations on YouTube, she's a modern-day Gandhi. This documentary helped me understand farm subsidies and how those government policies came to be. I now see how the intentional overproduction of corn has driven down overall food prices in real dollars during the past 30 years. Perhaps I'm missing something, but it seems like farm modern industrialization is so efficient that corn farming is not nearly as laborious as I imagined. As documentaries go this is a wonderful one and if I do say so myself a fair one. Never fully realized that all that corn grown in places like Iowa, is inedible until its been processed and doctored up in some way. Or that some towns are supported by pure farm welfare programs called farm support, that we the taxpayers pay for. And now with the flooding in the region we will pay even more. I especially appreciated being reminded that we have cheap food in the United States because so much of it is made in some way by corn or corn syrup. America's heartland, (Iowa, particularly, in this film) is undergoing some serious changes and Aaron Woolf's expos�� on the commodity of corn is a welcome addition to those authors and filmmakers who investigate what we eat and how it's made. One thing stands out more than anything else....corn is ubiquitous. Two friends from college decided to track the process of growing America's #1 crop - corn. We see them rent their own acre of land and start, literally from scratch. They learn some of the evils and the economies of what has become the big business of agriculture - in some ways following in the footsteps of Roger Moore. They produce an eye-opening documentary. However these two pals do their investigating in a hands-on, non-confrontational way. As much as possible, they become a part of the Iowa community where they start their jovially hip adventure. They usher us through the process of sowing and reaping the corn, as it is done now with giant combines yielding billions of tons of grain every year. Then the friends pursue their crop as it is traded and processed, and as it makes its way to our tables in one form or another. They show how ubiquitous a part of our lives corn is. It is added as sweetener to almost all the processed food products we eat now, perhaps contributing to the epidemics of obesity and diabetes. It is the staple ingredient in most cattle feed. All of this commercial corn is foul-tasting, almost inedible in its primary raw state. The two young men do a good job of showing the details of the journey the corn makes from seed to feed. They include the way the crop is fertilized using ammonia. They touch on the herbicides sprayed on the fields and how these chemicals do their work of eradicating weeds without harming the young corn shoots. However, there's one glaring omission. The pals don't discuss pesticides at all, and seem not to have used any on their God's Little Acre. But the two also take the larger view. They probe the different philosophies that have guided Government programs dealing with farmers. They even track down Earl Butz, the controversial Secretary of Agriculture in the Nixon-Ford Administration, and interview him. He explains how he revamped and reversed the system of incentives given to farmers. He saw that they were paid, not for how much land they withheld from production, but for how much land they planted. This policy has contributed to the near-glut of corn on the market and to the creation of vast monoculture farms.